Being a Deacon is a wonderful call to service. Deacons are the "servants" or "caregivers" of the congregation. In this large congregation, people have all kinds of needs - they are recovering from surgery, grieving, lonely, ill, or otherwise in a time where they welcome the ministry of care from our congregation. In a very real way, Deacons are the hands and heart of the Church in our ministry of caring. 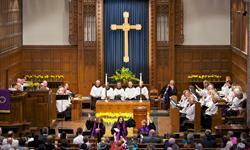 Serving as a Deacon of the First Presbyterian Church of Ann Arbor is a privilege and a blessing. It is also an opportunity for spiritual growth and fellowship. As a deacon, you are given the opportunity to know other church members in a deeper way, serving alongside them and growing in your understanding of the burdens people carry and how the church can help. Deacons and Elders will meet in the fall prior to the beginning of their term of service for 8 one-hour training sessions, held on Sunday mornings at 8 am. These training sessions are led by pastors. Deacons will also attend the Officers’ Retreat in the fall prior to the beginning of their term of service. 54 Deacons are nominated, ordained and installed by the church members, then trained by staff and current Deacons. Deacons then work under the guidance and supervision of Associate Pastor, Melissa Anne Rogers with the supportive fellowship of the other active Deacons. The Deacons serve for three years and Deacon meetings are held monthly (except July and August). Deacons at First Pres must be active members of the congregation who have demonstrated their support and contributions to the church and its work for at least one year. 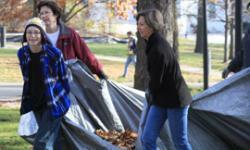 Each Deacon is assigned the responsibility to serve and communicate with a group of members known as a Chapel of approximately thirty individuals and/or families who live in a particular neighborhood or region of Ann Arbor and outlining areas. New church members may be added to a Deacon's Chapel for special welcoming care. Provide support and Christian love by communicating with Chapel members regularly to build community, share church information, ascertain needs, and lend support and assistance. With other deacons in the Quadrant, (a group of Chapels organized together), organize and host at church an annual Quad potluck brunch following the 11:00 church service on Sunday. Present the gift of flowers to church members to express sympathy, joy, and love at Easter, Christmas, and other special times. Serve communion, and, if needed, help host special gatherings during church holidays at various area retirement communities.